Patriotic Stars and Stripes Forever and Ever DIY Bottle Labels/Wrappers with a vintage design reminiscent of 1776. A vintage-style red, antique white and blue distressed design. 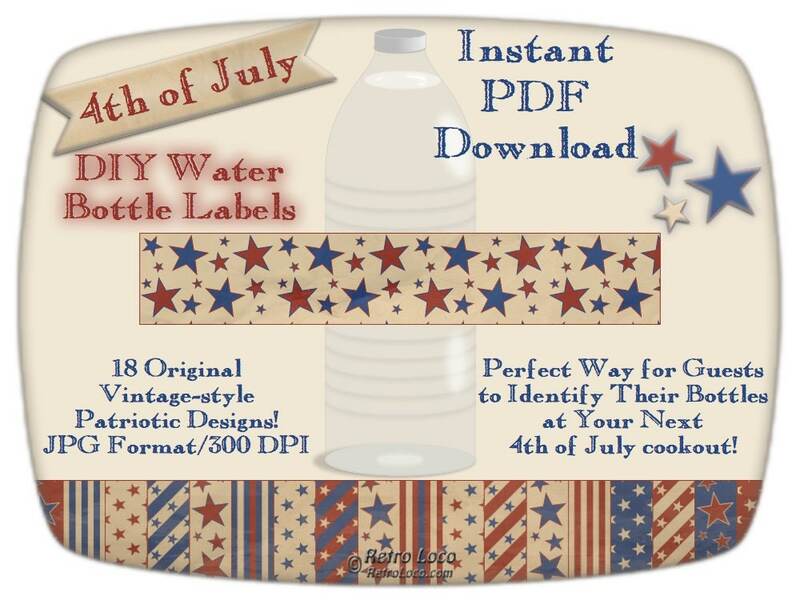 These bottle wrappers will be a hit at your next 4th of July party, Memorial Day cookout or Veteran's Day barbecue! Your water bottles will look festive and will help your guests identify their bottle when they set it down. Reminiscent of vintage patriotic flags, these original designs appear antiqued, old, grungy and dirty -- this was intentional! The antique white is more of a dark ivory or tan, because the design is intended to look over 200 years old. I used several techniques to create an old, antiqued appearance to the bottle label design and to the coordinating party supplies. Kids will have fun cutting out the paper strips and taping them to the bottles. Parents, please supervise young children while handling scissors! One PDF file will be downloaded. There are four pages in this PDF download, each page was saved at a high resolution of 300 dpi in jpg format. ● Page 1: Instructions and Tips sheet that includes standard and metric measurements. A list of materials that you will need is included. ● Pages 2-4: Rectangle shapes each with a different vintage-style patriotic design ready to cut out and attach. ● Do not sell or share your download with anyone. Please respect my copyrights by not distributing this file. ● If you want to use these bottle labels for a home, office or classroom party, that is permissible.